So I ended up having a huge amount of inks (at least to me, that does not have the space to store it) and Im contemplating the idea to make a glass shelf on the wall above my desk to store all pen related stuff, inks, pens, etcetera. So.. do you guys always store your inks closed in the boxes? Or do you show off your inks bottles? Yes in the box as it protects from potential fading from light. Also in a cool, dry location is preferred by me. I prefer to keep ink in the dark to slow down the change in colour. Those that are to tall too to fit in the drawer stay in their orignal boxes on a shelf. It is a little disapointing because the bottles are pretty. I keep all of my inks in their original boxes if they come in boxes. I would be very careful about a glass shelf, as it will need to withstand a heavy weight of ink bottles. I once had a glass table that I kept some cacti and succulents on. One day I came home and the glass had broken leaving a terrible mess. I keep my inks in their original boxes, if any, for ease of stacking and to keep them out of the light. I can always appreciate the bottles when I fill a pen. I didn't originally use boxes. But, now I do. They are easier to stack and are much more protected this way. Yes, the bottles can be pretty. I find that as I use an ink over and over, I do end up wearing out the box, so perhaps the boxes will disappear on some inks. One bad thing I do is store the inks on the main floor of my house. I get extremely hot summers here, and I know heat isn't good for them. I keep my inks in a large box in a cupboard to prolong their life and gaurd against excessive light and heat. I used to keep the bottles in their original packaging but then discarded them when I needed to make more room in the storage box. I regret ding that now. Will do so in future. Yup, original boxes. At the very least, they're a lot easier to stack. "Well, believe me, I calculated the odds of this succeeding versus the odds I was doing something incredibly stupid... and I went ahead anyway." A combination of both for me. I appreciate the bottles that are interesting to me & have them "front & center" on a shelf with the lesser interesting (& used) inks in their boxes, stacked on a shelf behind the "pretties." 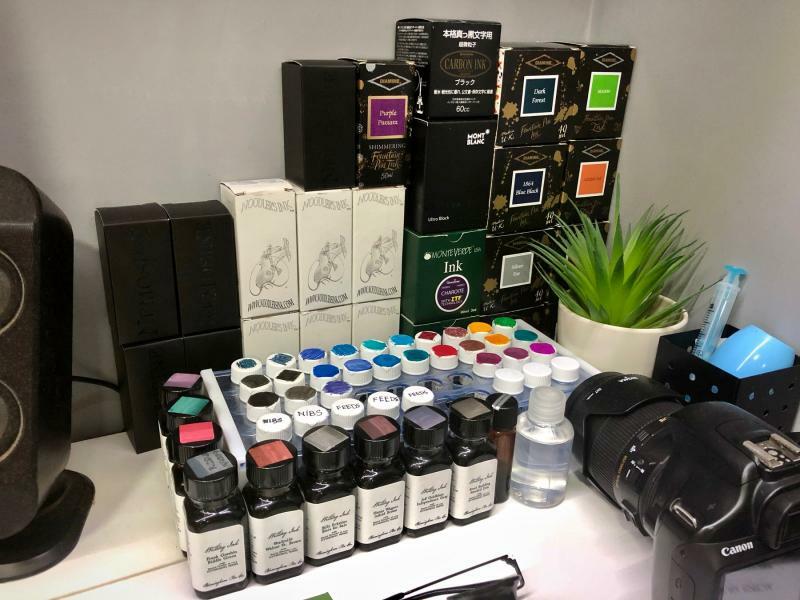 I have no concern about the preservation of my inks; I doubt I will live long enough to notice any changes & having already witnessed a few bottles of a US Boutique ink, turn foul in their boxes, without their even being opened, I use Phenol in inks I have concern for & hope for the best, for the remainder. In boxes in a drawer at the house, and a few out of boxes on a shelf at the office, with 3 out of the box on the desk that I use for regular refilling of the pens. If it would fade in the next 100 years, I would not own it in the first place. I always keep all the bottles in boxes inside a drawer. In that way they are better protected, and I can stack them more easily (or at least, I will stack them more easily if I ever need to do so - at present, I haven't got so many ink bottles, and anyway my drawer doesn't allow any stacking). The only exceptions are bottles that came without a box (30 ml Diamine bottles and Pelikan M205 Duo Highlighter ink). I'd like to find suitable boxes for those, but I haven't been lucky yet. In their original boxes, inside a drawer by my desk. Easier for me to pick the one I want to fill my fountain pen. For lack of space and money, they are neatly stacked (in their original boxes) in two plastic bins and then tucked away in a cupboard. I just keep one or two bottles out for refilling (no boxes). Hopefully, I will be able to display them someday. A little offtopic, but what are those inks in the black boxes? And the little bottles in the front that kind of look like small Diamine's? I've never seen that package before. I store mine in their original boxes and then inside an antique secretary desk. Some are in the top three shelves, the rest are in deep drawers in the base. I have to fight off radical temp changes, elevation, and a seven month old kitten. In the original boxes, and those boxes are inside sturdy cardboard boxes. Not a good system for ease of access, but it is what it is. The small bottles at the front look like Birmingham ink. No idea about the black boxes at the back. Thank you! Very nice line. Some of the colors look very interesting and the bottles/labels look elegant. Prices are also fairly good. I like how they offer a full set of samples; a very good deal.